Caring for a senior with dementia is a full time job, and it is hard work! Some families find ways to make it work at home, hopefully with members pitching in to provide care, distraction, supportive company and chores. And, everyone needs a break, and that can include the senior with dementia. Adult Day Memory Care can be just the answer to to give the senior the chance to engage with others in unique ways that can be stimulating and enjoyable. And provide a the opportunity for home caregivers to shift their focus and attention for a time. Caregivers have such an important role, and making sure they have time away to manage business, have some social time and re-charge will help them be more successful and stay healthier. Caregivers will often say their senior needs to stay home where it is familiar. While familiarity is important for folks with dementia, stimulation and engagement can be important too. I have seen seniors with moderate dementia really adapt and thrive in the rhythm of living at home, surrounded by family or familiarity, and spending regular time in a Day Memory Care Program. They have pleasant distraction and stimulation, and caregivers are less stressed, and everyone just does a little better. The senior does not have to be mobile to benefit from a day program. Wheelchairs or walkers are just fine, although if they are independently mobile, make sure the facility has taken precautions in the event a participant has the tendency to wander. They do not need to be able to verbalize their needs and wishes, or be continent. Well-trained staff who work daily with seniors with dementia will learn how to read your senior, and may be able to offer you tips to make your interactions with them better. Administering medication, providing toileting assistance, meals and eating assistance as well as shower assistance are common services. 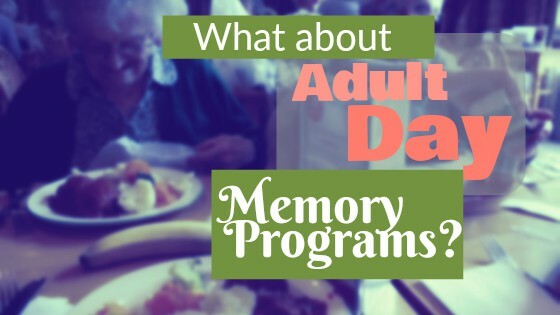 What should I look for in an Adult Day Memory Care Program? There are free standing Adult Day Programs and there are those that operate within residential assisted living/memory care facilities. Make certain the program you choose is licensed by the state, and is in good standing. If they are a residential community, check Medicare.gov for their rating. Costs will range from about $50 for 4 hours to $100 for 8 hours. Long term care insurance may cover the cost, based on benefits. Adult Day Memory Care can be an investment in the health and well-being of both the senior with dementia and the caregivers, and finding a good one will make it worth the cost. How do I find the right Adult Day Memory Care? If you need help finding a program for your loved one, we can help! Call AgeWise Advocacy & Consulting at 913-213-8799.